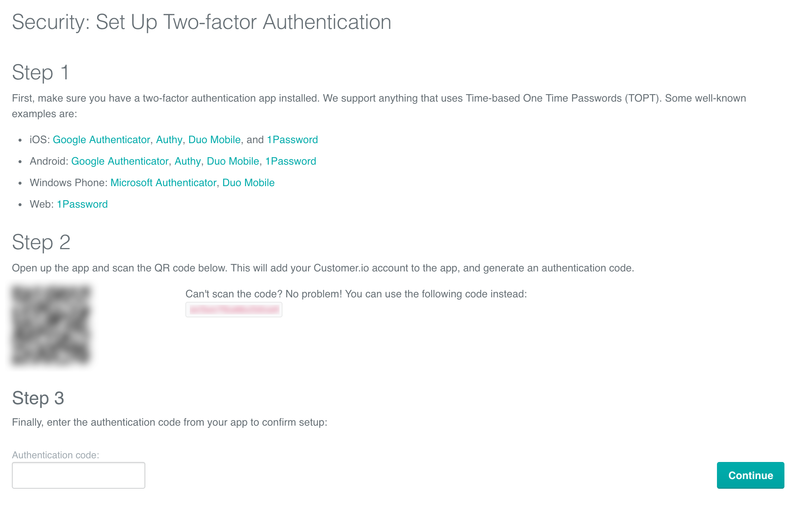 Two-Factor Authentication (2FA) is an additional layer of security on your Customer.io account. 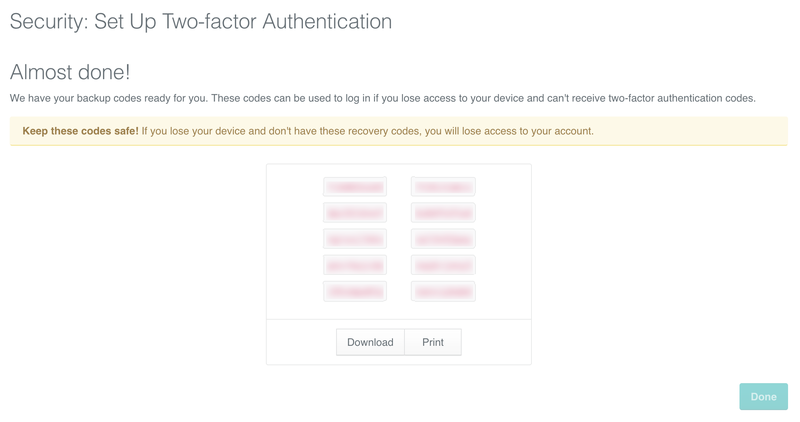 When 2FA is enabled for your account, an extra step is added to the login process. You&apos;ll be required to enter a code from an external authentication app in addition to your password. Enabling 2FA means that even if your regular password is ever compromised or stolen, only you can log into your account, because only you have the authentication code. We highly recommend enabling 2FA on your Customer.io account. Thankfully, the setup process is easy, and you only need to do it once. 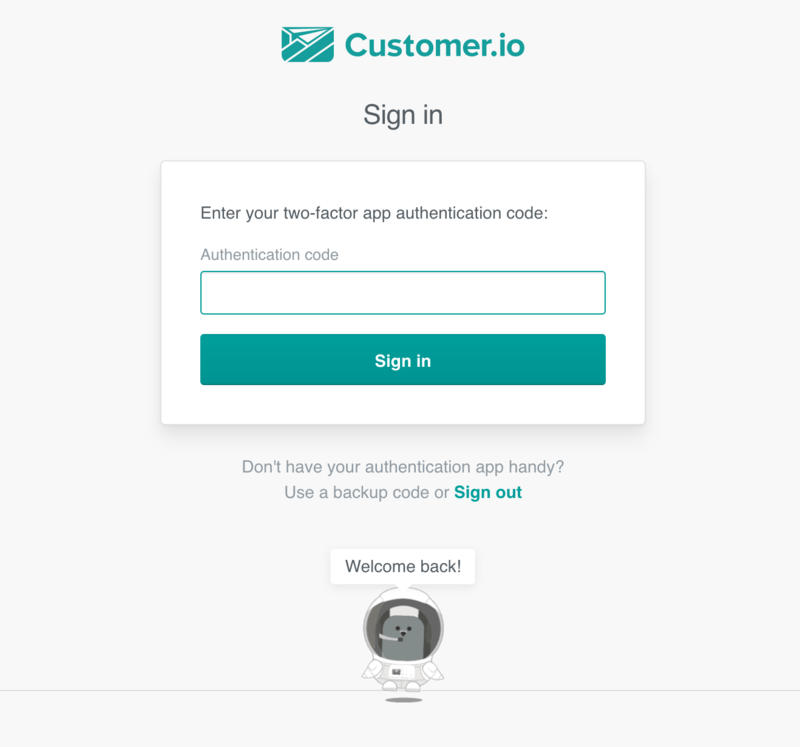 Go to your Account Settings in Customer.io, and click Security. You will see here that 2FA is disabled. Click Enable to start the process, and have your authentication app at the ready. Save your backup codes (and keep them safe)! That’s it! Once you save your backup codes, two-factor authentication is set up. If you return to this page in the future, you can view your backup codes or generate new ones— just remember to get rid of the old codes if you do the latter. Can I enable two-factor authentication for the rest of the users in my account? If you are an admin on your account, you can see which team members in your account have 2FA enabled or disabled, but it&apos;s not currently possible to enable or disable 2FA for each team member. I lost my device/I&apos;m locked out! What do I do? Note that once you use a code, you can&apos;t use it again. If you have other team members with admin privileges, have one of them remove your account and re-add you on the Team Members page. You&apos;ll have to re-set a password and set up two-factor authentication again, but you&apos;ll regain access. Team member accounts have no account data associated so it&apos;s completely safe to be completely removed and re-added. If you have no backup codes and no other team members, you&apos;ll have to contact our support team and we’ll have to verify your account details and identity. This option may take a little longer, but accounts contain sensitive information and we want to keep someone who may be impersonating you from gaining access.